We understand that you have a unique vision for each room in your home. Unless you have a large budget for the floors, expensive materials such as marble or travertine floor tiles may be out of reach. The good news is this doesn’t need to affect your design. Fortunately, installing a luxury vinyl tile floor is one of the best ways to get the look you desire at a significantly lower price point. It’s versatile and affordable with stylish options that align with current trends. Are you looking for a durable kind of flooring that withstands damage for years to come? No matter how many people live in your home, or how many visitors pass through the door, our luxury vinyl tile flooring can handle it. We offer a premium selection and expedient LVT flooring installation, so you can achieve the floor of your dreams in no time. Using photo replication technology, today’s luxury vinyl is almost indistinguishable from another type of flooring. In fact, this flooring can reflect the appearance of even the priciest wood, ceramic and stone. Come to our local showroom to see just how striking this flooring is. With many different designs available in luxury vinyl flooring, you might end up spending hours trying to narrow down your choice! Stop by our flooring showroom where our team is happy to discuss your needs and offer appropriate suggestions. Even though luxury vinyl tile flooring is a breeze for us to put in, for the untrained installer it can be very tricky. For a precise, efficient job, turn to us for all of your LVT flooring installation. We have a staff of skilled professionals, which includes qualified installers, who are ready to take on your project at a time that is convenient for you. We handle the entire installation project from beginning to end, so you deal directly with us from the showroom to your own room. Our community has given us great feedback and we continue to work closely with clients to ensure they get the stunning new floors they expect and deserve. The main reason why homeowners spend extra money on their floors is quality. We’re led to believe that the more expensive something is, the better it is. When it comes to luxury vinyl tile flooring, this simply isn’t the case. Not only is this flooring an exceptional visual match for any higher-priced tiling on the market, it is made to withstand the test of time, too. Each tile has several layers, including a protective covering that is designed to extend the lifespan of your floor. 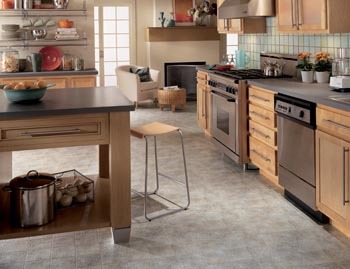 The digital patterns that allow these tiles to mimic the look of more expensive flooring are secured by this layer. Even large families with multiple pets can choose a luxury vinyl tile floor and rest assured it will stay beautiful for many years to come. When you come to us, feel confident that your satisfaction is our top priority. Your business is important to us so we take every request into consideration. We also offer free consultations and coupons so you can find new ways to save even more. In addition, we offer some of the best warranties in the industry, so you can be sure that your investment is protected for many years to come. Contact us today for luxury vinyl tile solutions. We proudly serve clients in Flower Mound, Dallas, Lewisville, Highland Village, and Grapevine, Texas.